Get out your favorite markers or crayons. We all need them for this, AndHeDrew’s Book of Coloring. See, the pages in this coloring book all flow together into one cohesive design. Color each page individually, then take them out of the book and place them side by side by side by side – in any order. Every page fits together with all the other pages – can you even imagine? I think this is genius. As we finish the pages, Malachi has been hanging them up on his Lego Room wall. Definitely check out AndHeDrew’s Book of Coloring for your family! AndHeDrew is giving away one printed copy of his Book of Coloring plus two digital copies! Enter the Rafflecopter below for a chance to win. I’ll select three random winners on Wednesday, September 14. I know my son and I would love this book! I am fascinated with the process it must have taken to create these! Thanks for the chance to win! My daughter would love this! Looks fun. Thanks for the opportunity! Forget the kids! (Just kidding!) I want this book! How creative and fun! What a genius idea!Was just wondering if I could use some adult coloring pages as wall art. This would be perfect! Who would have thought that coloring books would make a come back?!?! This would be great for my daughter and me. We have a great time coloring together. Very cool and unique coloring book. This would be great to do with my Grandchildren! Thank you for the chance to win. What a fun activity to do with your loved ones! So creative. With three boys that are coloring fiends, this would be a win in my house! SO Cool! I’d love to color — if only I had time! Maybe winning a book like this, I’d find the time! Thanks for the offer, Laura! I think two of my daughters would love to do this with me! My daughter will love this! Thanks for this fun giveaway!!! Would love to color these with my kids! My whole family would do this together! I can see us sitting around the wood stove on a cold winter evening all coloring together. This would be great! Thanks! My daughter in law loves coloring these books. I have given her some and I am sure she would love more. Thank you for the giveaway. these would be so much fun. I would love to do this with my kids! We love coloring. This sounds like so much fun! This looks like the most amazing coloring book ever!!! What a fun idea for my AHG unit of Pioneers and Patriots! I really need to start coloring! I find coloring so relaxing! This would be fun for the family wall art! That looks like a great family activity! Great coloring book! Hope I win! I have not tried coloring as an adult. None of the books I see really appeal to me. However, I really like the abstract shapes and cleanness (if that’s a word). I would definitely try this. Thank you for a great give away. These do look like a good family activity. What an awesome give-away! Thanks for the opportunity to win. I have ALWAYS loved coloring and hated to ‘grow up’ and not be able to color any more. Glad to see adult coloring books are popular now, although I haven’t bought one yet. Thanks again! Wow ! Great books ! That is crazy!! Oooh, I like Hannah’s idea of everyone in the family coloring one. Wicked sweet! So cool! My son would LOVE these! This is the coolest thing ever! My daughters and I love to color! I have seen the ‘adult coloring books’ but this is amazing. I love the geometric patterns and it is magic how they all go together. So cool. Thanks for sharing. I love to color and this book sounds like a fun thing to color. What a creative addition to the world of grown-up coloring! I have more than one family member who would love this! Thanks for the opportunity! And congratulations to your designer friend! Wow! The pages look amazing! Would love to be a winner! My son is bored with regular kids coloring books. He loves puzzles, so maybe a puzzle-like coloring book would capture his interest! Thanks! We love to color. This book looks awesome. Fun & relaxing at the same time! Fitting them together is a great idea. We love adult coloring books over here and enjoy coloring together! We would love a copy. Thanks! I would love this, and my kiddos would, too!! My grandkids and I would have a blast with this! The perfect way and place to doodle. Very unique and intriguing. Love to do these with my daughter! My Mom enjoys adult coloring books. This would make a great gift for her. This is so cool! I’ve never seen this before. 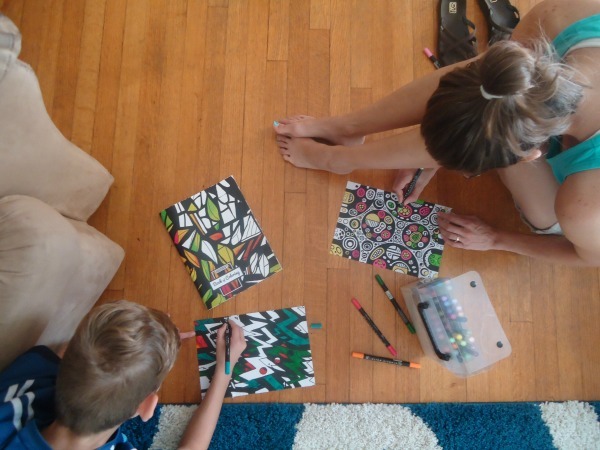 2 of my children and I love to color – these books look great! Love this! My daughter would go nuts over this book – she would love to decorate her walls in our new house with custom art! It’s too cute, but my mother-in-law has (re)discovered coloring at 80 years old! I would love to be able to do this with her, or my 4 and 5 year old daughters also love to color with Grandma! That is the coolest! My children and I would have a blast with that. Your “site design guy” is brilliant. This book would be really fun to have others color each a different page and then hang as family art. I’ve started coloring again and it’s so much fun. Those coloring pages remind off the doddling that I have always done, so pretty. Woah! 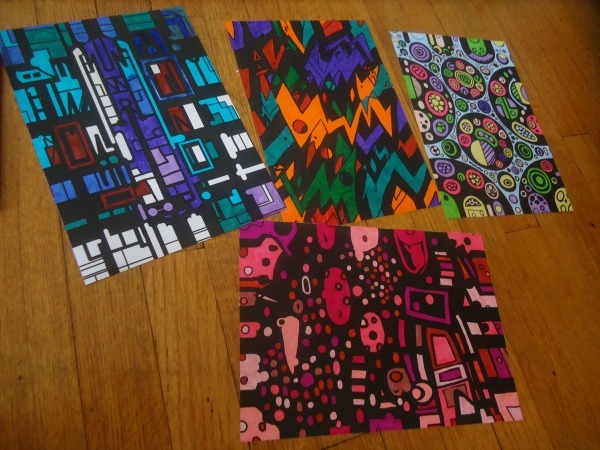 Those are some cool coloring pages! Thanks for sharing.